Milla Jovovich as Natalie Artemis and Tony Jaa as the Hunter. The world of Monster Hunter is the kind of lush place teeming with impossible life that would be difficult for any studio to translate to the big screen in a way that immediately resonates with people familiar with the franchise. But the first look at the Milla Jovovich-led film reveals that while the studio is taking a couple of creative liberties here and there, this is definitely going to be a Capcom movie. In an interview with IGN, director Paul W.S. Anderson explained how even though Jovovich’s Natalie Artemis isn’t meant to be one specific character from the games, her design is actually a nod to the ways that characters are able to mix and match armor and weapons to create kits of their own personal liking. Artemis, Anderson continued, acts as a cipher for audiences to project themselves into—a representation of people sitting down to play Monster Hunter. 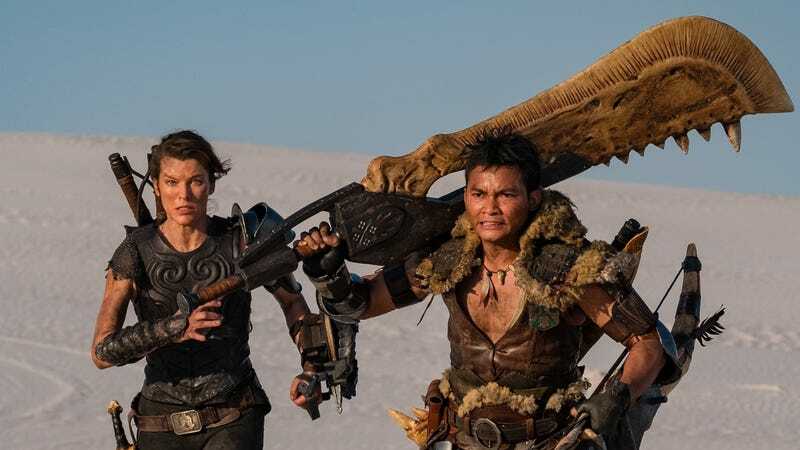 Jovovich playing people in video game movies that aren’t actually from the games is nothing new, but what really jumps out about this first look at Monster Hunter is Tony Jaa’s Hunter. His outfit and weaponry bear more than a striking resemblance to the Field Team Leader from Monster Hunter World. Behind our world, there is another: a world of dangerous and powerful monsters that rule their domain with deadly ferocity. When Lt. Artemis (Milla Jovovich) and her loyal soldiers are transported from our world to the new world, the unflappable lieutenant receives the shock of her life. In her desperate battle for survival against enormous enemies with incredible powers and unstoppable, revolting attacks, Artemis will team up with a mysterious man who has found a way to fight back. Just how Sony intends to bring the world of Monster Hunter to life remains to be seen, but you’ve still got some time to dream up your own predictions before the studio announces a proper release date for some time in the near future.